circulatory system the major system concerned with the movement of blood and lymph, consisting of the heart, blood vessels, and lymphatic vessels. (See also color plates.) The circulatory system transports to the tissues and organs of the body the oxygen, nutritive substances, immune substances, hormones, and chemicals necessary for normal function and activities of the organs; it also carries away waste products and carbon dioxide. It equalizes body temperature and helps maintain normal water and electrolyte balance. An adult has an average of 5 liters of blood in the body; the circulatory system carries this entire quantity on one complete circuit through the body every minute. In the course of 24 hours, over 6500 liters of blood pass through the heart. The rate of blood flow through the vessels depends upon several factors: force of the heartbeat, rate of the heartbeat, venous return, and control of the arterioles and capillaries by chemical, neural, and thermal stimuli. 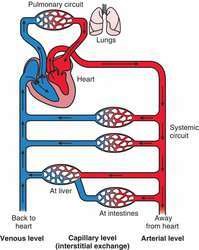 Pulmonary and Systemic Circulation. There are in reality two independent circulatory systems within the body, each with its own pump inside the sheathing of the heart. In one of these systems, called the pulmonary circulation, the right side of the heart pumps blood through the lungs. In the lungs, the blood gives up its carbon dioxide and absorbs a fresh supply of oxygen. The reoxygenated blood then flows to the left side of the heart, and is pumped out again to all the systems and organs of the body. This major circulatory system is called the systemic circulation. The circulation of blood through the fetus bypasses the pulmonary circuit (see also fetal circulation). Arterial System. Blood pumped from the left side of the heart enters the aorta, the main arterial trunk of the systemic circulation. The aorta, which is about 1 inch in diameter, arches upward and toward the left side of the body. Just above the heart two coronary arteries branch off from the aorta. These arteries supply the muscles of the heart with blood. Branching from the top of the aortic arch are three large arteries which supply the upper part of the body, the brachiocephalic trunk (which divides into the right carotid and right subclavian arteries) and the left carotid and left subclavian arteries. The carotid arteries supply the head and neck; the subclavian arteries supply the arms. The aorta then turns downward and passes through the trunk of the body, close to the vertebral column. Smaller arteries branch off from the aorta to supply the lungs, stomach, spleen, pancreas, kidneys, intestines, and other organs of the body. At about the level of the umbilicus, the aorta divides into two branches, the two iliac arteries, which supply the vessels of the pelvic organs and the legs. The arteries so far named are the main conducting arteries. They consist of a smooth inner lining covered largely by elastic fibers that absorb the pulsations of the heart. As the heart beats, the elastic arterial walls damp the strong pulsations into a more nearly constant blood pressure. Distributing arteries branch out from the conducting arteries. These arteries are composed largely of muscle fibers that encircle the smooth inner lining of the blood vessels and have the ability to contract and relax. The distributing arteries in turn branch out into arterioles, or little arteries, which are barely visible to the eye. The elastic walls of the arterioles and distributing arteries are under the control of the autonomic nervous system. The arterioles lead directly to the capillaries. Blood passes through the aorta at the speed of about 40 cm per second when the body is at rest, and at a faster rate when it is active. As the blood spreads through the distributing arteries and arterioles, its speed gradually diminishes. By the time the blood has reached the capillaries, it has slowed to a speed about one-eightieth of that in the arteries. Capillaries. The complex network of innumerable and microscopically small capillaries distributed throughout the tissues supplies blood to all cells in the body. Each capillary is about 10 microns in diameter, about the size of a single blood cell; thus the blood cells must make their way through the capillaries in single file. Despite their minute size, the capillaries have a vast total area. The capillary “lake” can be called the climax of the circulatory system, for it is here that the vital work of the circulatory system is carried out. Nutrients leaving the blood capillaries enter the capillary lake, a collection of tissue fluid which bathes each cell. From there the nutrients permeate the walls of the cells. Waste products of cell metabolism enter the capillary lake and eventually pass through the capillary wall and into the blood circulation. The capillary walls are selective; i.e., they permit the exchange of special nutrients and chemicals and bar the passage of unwanted substances. For example, the cells making up the walls of the capillaries in the brain bar the passage of many substances that might injure the brain cells, and the capillaries in the placenta also act as a barrier against substances that might be harmful to the developing fetus. Venous System. From the capillaries the blood returns to the heart via the veins, which together make up the venous system. The blood flows from the capillaries to minute venules, and then to the veins, in a network of blood vessels of ever-increasing size that parallels in reverse the branching of the arterial system. The walls of the veins, however, are thinner, less elastic, and less muscular than those of the arteries. And whereas the arteries are for the most part buried deep within the body for protection, the venous system has many superficial veins that run close to the surface of the skin. If an arterial blood vessel is cut, the blood flows from the cut in spurts, whereas blood from a cut vein flows steadily. The blood returning to the heart collects into two main veins. Blood returning from the arms, head and upper chest flows into the superior vena cava; blood returning from the rest of the body flows into the inferior vena cava. Both these veins return the blood to the right side of the heart. The blood from the lower part of the body must return to the heart against the force of gravity, since all the pressure built up by the heart has been dissipated in the capillaries. This is accomplished in several ways. The veins themselves contain one-way venous valves which work in pairs. When the blood is flowing in the correct direction, the venous valves are pressed against the walls of the veins, permitting unobstructed flow. If the blood should tend to flow backward, however, the venous valves fall inward and press against each other, effectively stopping the backward flow of blood. The blood is “milked” upward toward the heart principally by the massaging action of the abdominal and leg muscles as they press against the veins. Inspirations of air also force the blood through the venous system, as do the movements of the intestines. If the leg muscles do not move for long periods of time, the blood collects in the lower part of the body and the amount available for the brain is decreased. Systemic Circuits. The circulatory system has been discussed so far as if the blood flowed through the body in a simple circular path. In fact, the blood can take one of several circuits through the body. Among these circuits are the coronary circuit through the arteries and veins of the heart; a circuit through the neck, head, and brain; a circuit through the digestive organs; and the renal circuit through the kidneys. The importance of the renal circulation lies in the fact that the kidneys act as the cleansing filter of the circulatory system, removing a variety of products that have been cast off from the cells and body tissues. At any given time, about one-quarter of all the blood pumped through the body is passing through the renal circuit. The most complex circuit (portal circulation) is that which flows through the digestive system, picking up proteins, carbohydrates, fats, and chemicals from the intestines and delivering them to the tissues. Separate distributing arteries conduct the blood to the lower intestine, upper intestine, stomach, spleen, and pancreas. The veins leading from these organs combine to form the portal vein, which leads to the liver. Within the liver, the artery leading to the liver (the hepatic artery) and the portal vein subdivide themselves into a complex network of capillary-like vessels called sinusoids which bring the blood into closer contact with the cells of the liver. The liver cells withdraw glucose from the blood for storage as glycogen or release it as needed, and remove from the blood many harmful substances that might be toxic to body tissues. The blood leaving the liver flows to the inferior vena cava. Lymphatic System. The cells, chemicals, and other components of the blood are suspended within the blood vessels in plasma. Similar fluid also fills the spaces between the tissue cells. Nutrients reaching the cells are carried there by this tissue fluid, and it also carries waste products from the cells to the capillaries. One function of the lymphatic system is to collect and return this fluid via the lymphatic vessels to the circulatory system. When this tissue fluid is within the lymphatic system, it is called lymph. In addition to draining off excess tissue fluid, the lymphatic capillaries also transport some waste products as well as dead blood cells, pathogenic organisms in case of infection, and malignant cells from cancerous growths. From the lymphatic capillaries the lymph is carried into larger lymphatic vessels which contain one-way valves similar to those in the veins. 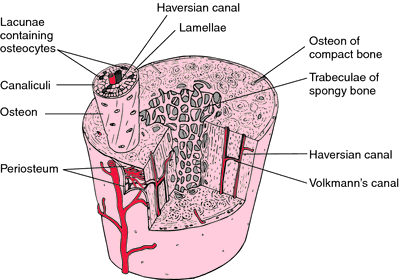 Lymph nodes are interspersed among the lymph vessels and filter their fluids. Eventually large lymph ducts (the thoracic duct and right lymphatic duct) empty into the right and left subclavian veins. The lymph is propelled by the same massaging action that causes the blood to circulate through the venous system. There are larger masses of lymphatic tissue called lymphatic organs, and among them are the spleen, tonsils, and thymus. These organs produce specialized leukocytes (lymphocytes) that help protect the body against infections (see also immunity). 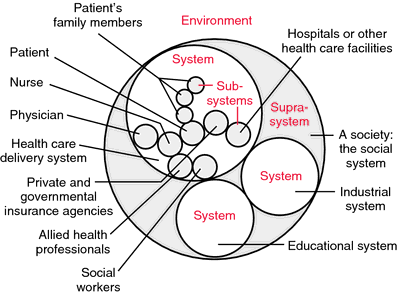 the cardiovascular and lymphatic systems collectively. 1. The system of structures in vertebrates consisting of the heart, blood vessels, and lymphatics, by which blood and lymph are circulated throughout the body. 2. A similar system by which a fluid, such as hemolymph, is distributed in other animals. the network of channels through which the nutrient fluids (blood) of the body circulate. The cardiovascular 'plumbing,' heart, arteries, capillaries, veins, which transport oxygenated blood from the lungs and heart to the general circulation, and return deoxygenated systemic blood to the lungs and heart. See Heart. n the system for the circulation of blood, consisting of the heart, arteries, arterioles, capillaries, venules, and veins. shock; circulatory insufficiency without congestive heart failure. includes cardiac or central circulatory failure and peripheral circulatory failure. Although the mechanisms, causes and clinical syndromes are different the pathogenesis is the same, the circulatory system fails to maintain the supply of oxygen and other nutrients to the tissues and to remove the carbon dioxide and other metabolites from them. The failure may be hypovolemic, distributive. changes in the cardiac and vascular functions in response to such factors as emotional stress, physical exercise, temperature change. the major system concerned with the movement of blood and lymph; it consists of the heart and blood vessels. The circulatory system transports to the tissues and organs of the body the oxygen, nutritive substances, immune substances, hormones and chemicals necessary for normal function and activities; it also carries away waste products and carbon dioxide. It helps to regulate body temperature and helps maintain normal water and electrolyte balance. The rate of blood flow through the vessels depends upon several factors: force of the heartbeat, rate of the heartbeat, venous return and control of the arterioles and capillaries by chemical, neural and thermal stimuli. The purpose of this study was to investigate the morphometric characteristics of the moose heart, structural and comparative anatomy of its circulatory system, and to quantitatively estimate specific volumes of structural components of the cardiac circulatory system (conducting cardiocytes, hemocirculatory path, conductive tissue, and stromatic elements) in moose, calf, pig, and man. They do, however, note that because rubella attacks the circulatory system first, lesions to the central nervous system are associated with circulatory deficits and the attendant lack of nutrition (in the medical sense of abundant blood supply for healing and development) to the adjoining cortex. At the heart of saving lives is making sure a patient's circulatory system is working right. together with a set of lines for carrying out the body by the circulatory system. At least some such particles, when inhaled into the nose, shimmy up the nerve bundle that governs smell and infiltrate the central nervous system, bypassing the natural firewall between brain tissue and the main circulatory system, new research suggests. The "suggestion that photic signals are carried from the back of the knee to the human brain via the circulatory system is not supported by our data," they conclude. What makes them dizzy is a temporary dysfunction of their circulatory system. Researchers at the University of Pennsylvania in Philadelphia have shown that a molecular clock in the circulatory system oscillates in a 24-hour rhythm in step with cells in the brain. The AbioCor sustains the body's circulatory system and is designed to extend the lives of patients who would otherwise die of heart failure, while also offering a probable benefit for a satisfactory quality of life. In 1889, Stephen Paget proposed that cancer cells shed from an initial tumor were dispersed randomly throughout the body by the circulatory system. In addition, the cigar puffers faced twice the risk of dying from all forms of cancer and from certain diseases of the circulatory system, such as cardiomyopathy, a disorder of the heart muscle. The latter are two-shelled creatures that bear a superficial resemblance to clams but have a less advanced circulatory system.